Wishing everyone the Best of the Holidays, Merry Christmas, and Happy New Year! The the latest challenge of 2014, the CRAFT Challenge is Anything Goes! I decided to forego the Holiday Season and make a birthday card. I used a sentiment from Sassy Studio Designs called SentiMints – Birthday Cake and a penguin from Bugaboo Stamps called Birthday Penguin – Cake. Please be sure to check out other great stamps from our sponsors! Added 3 gems to finish it off. This challenges run from December 25th – December 31st. Hope you will join us! I am so excited to make a non Christmas card today. I am getting a little low on Birthday cards so I designed my birthday bears card on Sketch 87 from Atlantic Hearts Sketch Challenge. 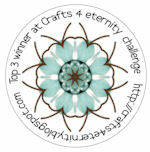 I used a wonderful little trio stamps called Posy Trio from Lili of the Valley Stamps. They are located in the UK but the shipping costs were reasonable and I got my stamps within a week. I coloured the bears with Copics. For the background, I used a Happy Birthday embossing folder from Crafter’s Companion. The tag and stamp are from SSS. I decided to try to make this card in a pencil coloured, kraft card stock version vs a Copic coloured white card stock one. Both cards are similar yet have a completely different feel. I used 2 stamps from Whimsey Doodle – Ginger and Cup, and Cocoa with Friends. The sentiment is from SSS. I used a snowflake embossing folder, twine and plaid paper for the background. Words 2 Scrap By Challenge #12: Eat, Drink, and Be Merry!